Crooked Lane Books, 9781683316176, 320pp. This pulse-pounding series debut is the next obsession for fans of Julia Keller and David Bell, and readers of unflinching thrillers. Sometimes, the journey home is the most harrowing. And it's every parent's worst nightmare. Investigative journalist Laura Chambers is back in her tiny hometown of Hillsborough, North Carolina, the one place she swore never to return. Fired from the Boston Globe, her career in shambles, she reluctantly takes a job with the local paper. The work is simple, unimportant, and worst of all, boring--at least until a missing girl turns up dead, the body impeccably clean, dressed to be the picture of innocence. Years earlier, ten-year-old Patty Finch left home and never made it back. But for the people of Hillsborough, Patty was just the beginning. Child after child disappeared, a reign of terror the town desperately wants to forget. Now that terror has returned to seize another girl. And another. And another. This is the story Laura's been waiting for--her one last chance to get back onto the front page. She dives deeper into a case that runs colder by the second, only to discover the truth may be far closer to home than she could have ever imagined. 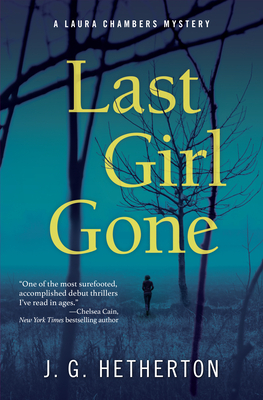 Powerful, intricate, and tense, Last Girl Gone will have you looking over your shoulder long after the last page. J. G. Hetherton was in raised in rural Wisconsin, graduated from Northwestern University, and lived in Chicago for the better part of a decade. Along the way to his first novel, he dabbled in many different day jobs before moving to North Carolina for a girl. They live in Durham, North Carolina with their twin daughters, and when he's not writing, you can find him on the hiking trail or sitting down with a good book.